My assistant and I -- we love potlucks. They're so much fun, all the cooks and bakers put their best feet (or spatulas) forward with homemade goodies, and even store-bought items seem to taste better than they would on any other occasion. While I (being imaginary) can only taste the smorgasbord vicariously, I can certainly draw inspiration from the personal touches that the home cooks put into their dishes, the buttery treats that the bakers display with pride, and the happy laughs and chatter all around. Let's take a stroll back into summer, mid-August, when my assistant didn't have a chance to more regularly update this blog. My assistant's Auntie Betty and Uncle Soph are no strangers to Carrie Cakeaway. With their lush, beautiful vegetable garden, it was only fitting that they host a summer harvest party for family and friends. From a colorful salad made exclusively with vegetables freshly picked from the garden to their famous butternut squash bisque, this was a beautiful afternoon that ended with cake, cake, and more cake. My assistant and I brought a colorful chocolate fruit cake -- rich, chocolate cake layered with fluffy meringue frosting and sweet strawberry slices, and topped with more fluffy meringue, strawberry halves, and freshly diced mango. 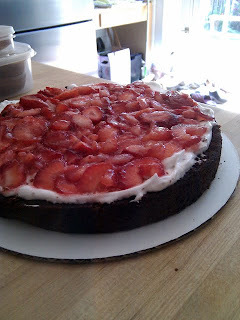 In the spirit of full disclosure, this was meant to be a "chocolate-dipped strawberry cake," with strawberries, chocolate, and not much else. 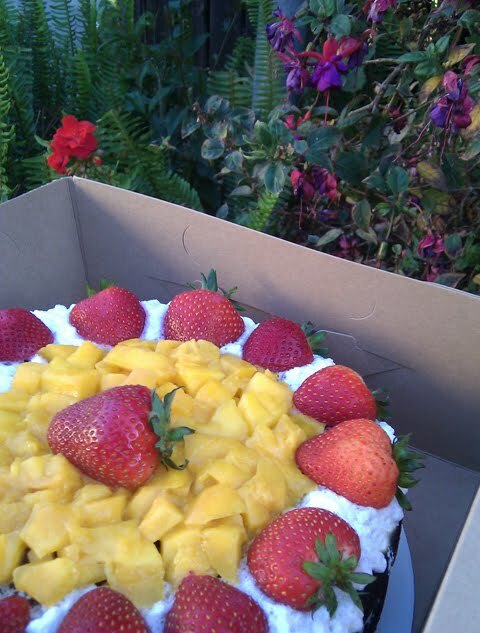 However, a ripe, juicy mango was employed to cover up the top center where the delicate frosting had deflated in the summer heat. The result? A cake that was easier on the eyes and still a hit with the party guests. Thanks again for hosting, Auntie Betty and Uncle Soph! Cheers to you both, your bountiful garden, and a beautiful summer potluck.